There was a time when the robust capabilities of enterprise Internet Protocol (IP) telephony was out of reach for most small to midsize businesses (SMBs). The significant initial investment and ongoing expenses created a barrier to entry that left smaller companies limited to inflexible, expensive traditional phone systems or consumer-grade Voice over IP (VoIP) solutions. 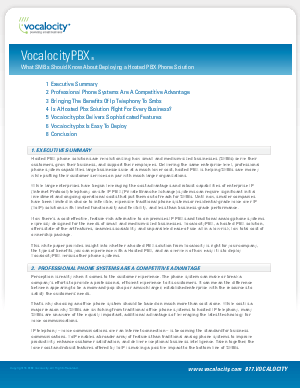 This white paper explores the new options available to SMBs, and how hosted PBX can deliver the same enterprise-level, professional capabilities that large businesses use—at a lower cost.